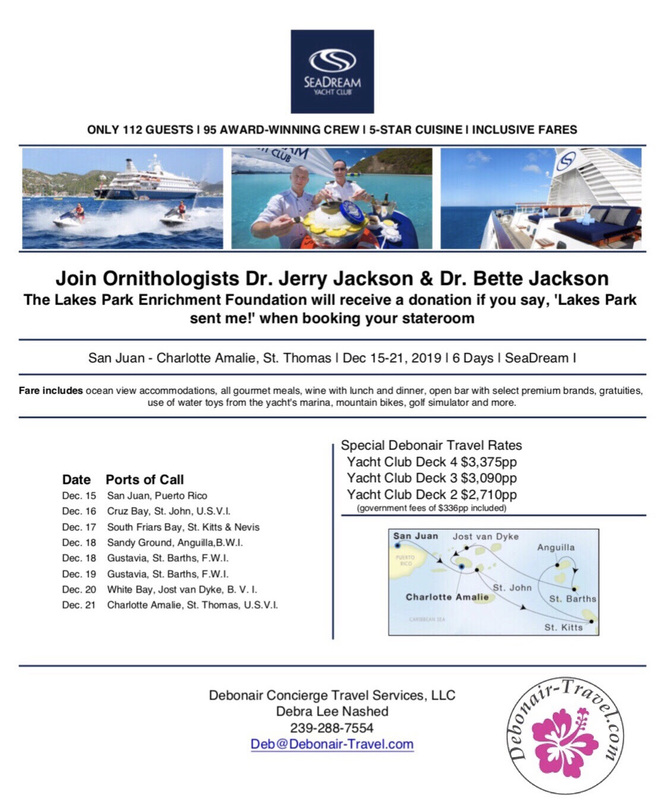 Dr. Jackson will discuss the bird species that he’ll be looking for as he leads tours in the Caribbean on the SeaDream, an intimate 112-passenger yacht. Cruise dates are Dec. 15-21, 2019. Cheese & crackers, cookies & soft drinks will be served. This birding cruise is a fundraiser for the Lakes Park Enrichment Foundation. The Foundation will receive a donation for every cabin booked by someone who says, “Lakes Park sent me!”. 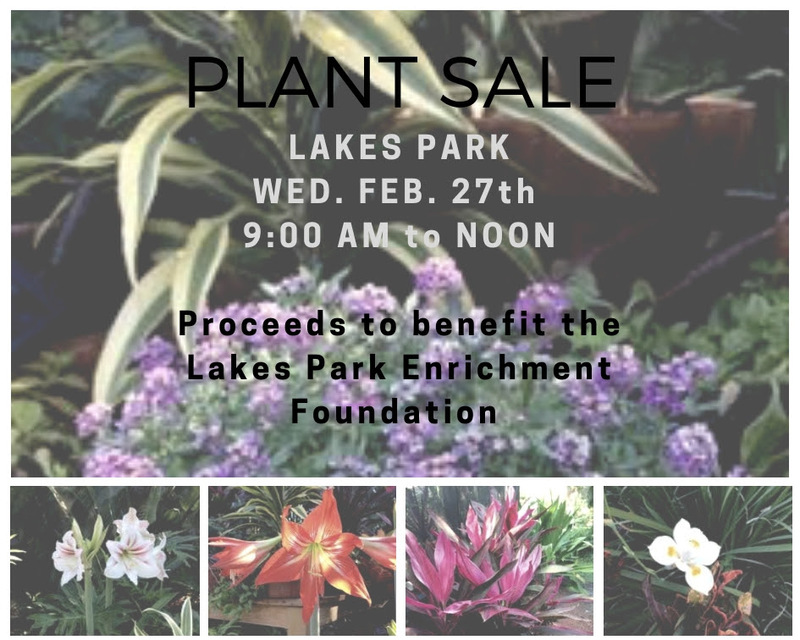 The Lakes Park Botanic Garden volunteers will host a plant sale in the Botanic Garden, Wednesday, Feb. 27, 2019 from 9:00 a.m. to Noon. The sale will take place in the propagation and potting area of the Botanic Garden. Proceeds to benefit the Lakes Park Enrichment Foundation. a fundraiser benefitting Lakes Park. 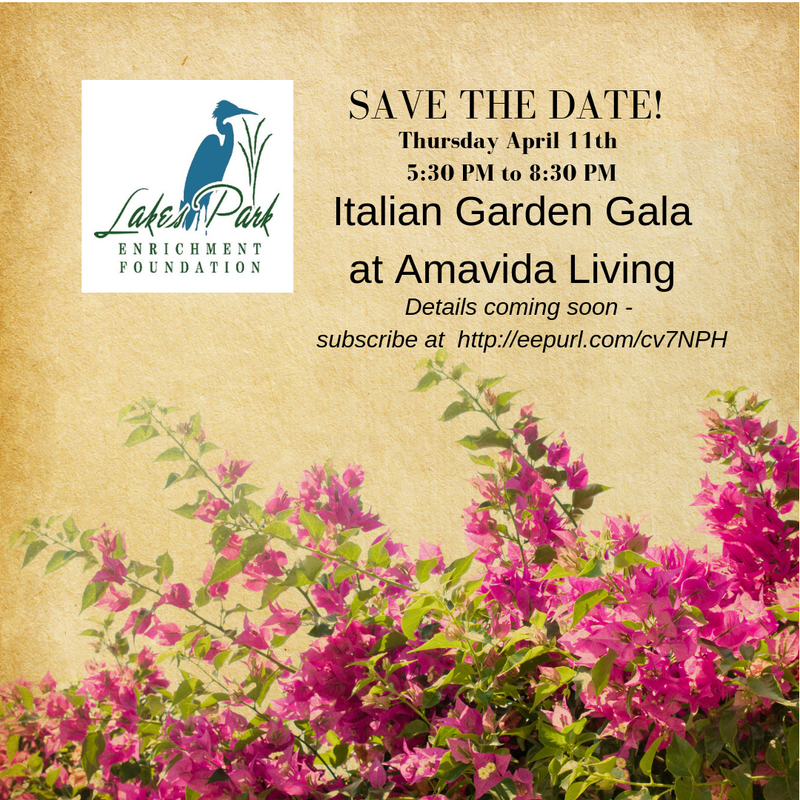 Cuisine and music from Italy will be featured, poolside at the beautiful new clubhouse at Amavida Living. 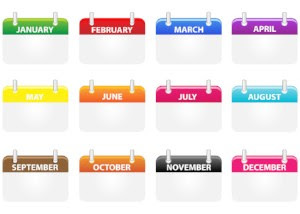 OUR FOUNDATION CALENDAR is just a click away! Saturday March 2, April 6 | 8 to 10 a.m.
Meet at Shelter A7 in the park. Walking tour with Bird Patrol guide. Bring camera, binoculars, water. Wear hat, sunscreen or other sun protection, comfortable shoes, appropriate clothing for the weather. Saturday March 9 | 9 to 11 a.m.
Saturday March 9, April 13 – 9 to 10 a.m.
Botanic Garden Tours occur on the 2nd Saturday each month, November through April for 2018. Tours are conducted by a Master Naturalist. Meet at the Community Garden sign by 9:00 AM. Wednesday March 20, April 17 – 10 to 11 a.m. Lakes Park Enrichment Foundation presents STORYTIME IN THE GARDEN, 3rd Wednesday of the month from October—April 2017 at 10 a.m. Stories, activities appropriate for the pre-school set. Parents must stay with their children. Meet in the Children’s Garden. Wednesday March 27, April 24 – 9 to 1 p.m.
Farmer’s Market – take a stroll, buy fresh produce, stay for lunch! 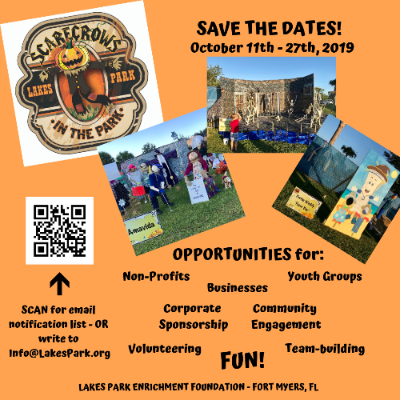 The Lakes Park Enrichment Foundation, in conjunction with Local Roots, LLC, hosts the Farmers Market, which features growers, producers and suppliers of fresh fruits, vegetables, organics, seafood, meats, cheeses, prepared foods, flowers and more. There are breakfast and lunch items to choose from while enjoying the park and browsing the market. Parking is free for market shoppers.